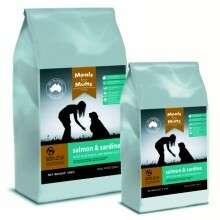 Meals for Mutts Salmon & Sardine is an Australian made and Australian owned, holistic formula, super premium pet food that contains all natural and organic ingredients that BM Pet Snax is proud to stock. You will find no preservatives, no wheat, no corn, no artificial colours and no meat by-products in this food. It is suitable for all breeds of all ages and is ideal for dogs with allergies or sensitivities. This formulation has been scientifically formulated so that all of the nutrients are in balance with energy to reduce the chance of obesity whikle ensuring peak nutritional benefits for your dog. Salmon & Sardine MfM has exceptional levels of omega 3,6 & 9 (DHA's and EPA's) and is excellent for your dog's brain function and may assist with cardiovascular health, teeth, nails, skin and coat and contains natural anti-inflammitory properties. Omega 3 fatty acids play a major role in the functioning of the immune system and the maintenance of all hormonal systems in the body. rotection against heart disease, progressive retinal atrophy and support for brain development in the womb are just a few of the many benefits seen when these critical fats are included in our pets diet. Puppies must be supplied with sufficient DHA before birth in order for the brains and nervous systems to develop properly. If the diet of the mother is deficient in DHA, her body will supply it as best she can, but she may never recover to her optimum level and her puppies may not have recieved enough. Ingredients Salmon & Sardine, ground brown rice, vegetables including peas, alfalfa, natural fats and oils, omega 3,6 & 9, yeast, kelp, vitamins A, C D3, E, K, B2, B6, B12, niacin, pantothenic acid, folacin, biotin, and natural organic acids plus minerals, calcium, phosphorus,sodium, copper, zinc, iron, manganese and iodine. Alao contains Yucca shidigera extract and natural flavours, and is preserved using nautral Vitamin E and rosemary oil. OR choose one of our farmers markets locations and we will have your product there for pick up. Alternatively please contact us directly by email or phone to arrange mail or personal delivery.